Thanks to the obscurity of Venezuelan winter league statistics, today's card--really a paper-thin stamp destined for a collector's album--features the first player I'm not too sure about. 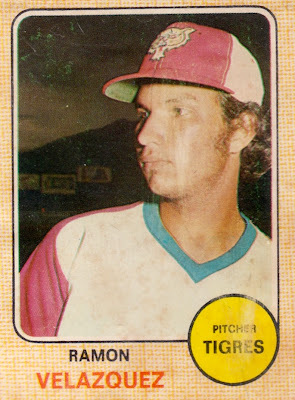 It's probably the born-in-1953 Ramon Velasquez, who pitched a year of Florida League A ball in 1973, but he's got a common enough Latino name that there could be two, including one who never left Venezuela. This 1974 set design mimics the 1968 Topps "burlap sack" look, down to its blocky player name and spot for team and position. Only one of the 275 stamps features a HOFer--native son Luis Aparicio--but a handful of MLBers appear in Venezuelan uniform and make for interesting collector conversation pieces. 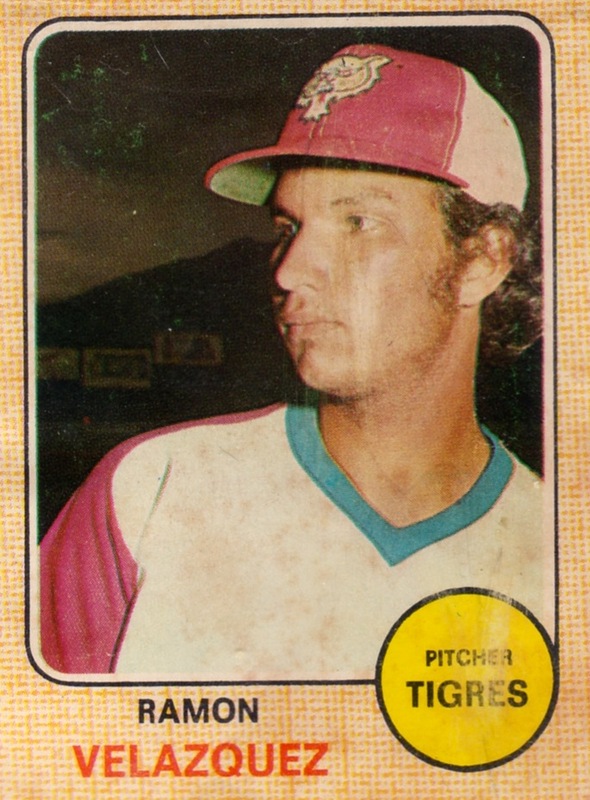 No matter which Ramon this is, his 1974-75 Tigres de Aragua went on to capture the Venezuelan league crown that year and repeated as champs in 1975-76. Aragua's won a total of 8 titles since their 1965 inaugural season, most recently in 2008-09. And who hit leadoff for that selfsame squad, leading the winter league in triples? 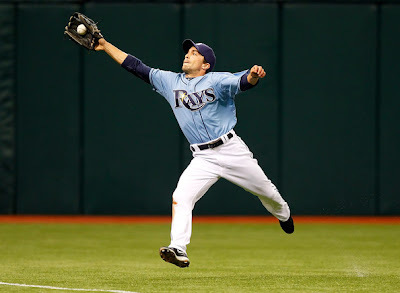 None other than the Legendary Sam Fuld. UPDATE: Thanks to OldBaseball.com trading friend Rick for picking up an original 1974 album and sharing some photos. The cover's a reproduction, so looks whiter than its original, but the remaining pages are original and show the "stickers" just how they'd been attached back in their day. There's Velazquez smack dab in the middle of its first page, under the Tigres team photo and next to Dave Concepcion. Other teams used the same format, group photo follow by logo and individual players. In major American sets, I think only 1980s Fleer tried grouping all teams together numerically. I don't believe Topps ever did this with a major set. Value: Bought my #5 Velazquez for $10 on eBay. The number's actually printed in the collector album, so doesn't appear on the stamp itself. See the flip below. Fakes / reprints: Both North and South American collectors desire the Concepcion and Aparicio stickers, so there might be some fakes out there. Make sure to buy from a dealer who knows foreign sets.